Gosh, I really do love doing meal prep! It makes me feel so organized and productive knowing I’m doing a weeks worth of meals (well usually breakfast, lunch and snacks) all in about an hour. 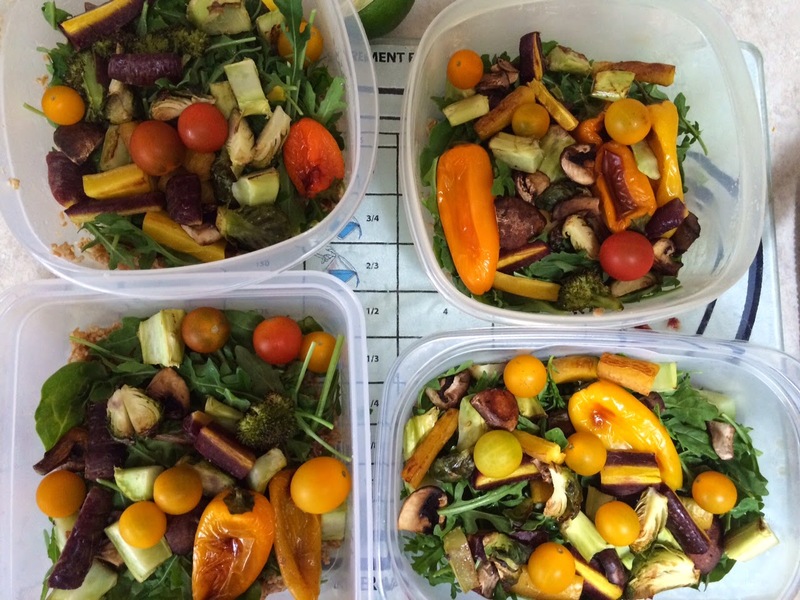 I especially love meal prepping salads because they always end up looking so pretty at the end! 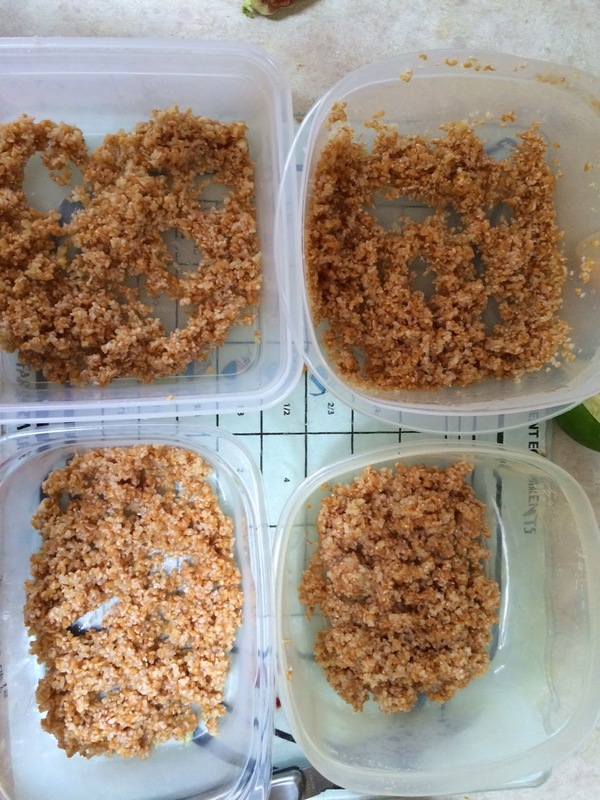 I usually start with a really fibrous grain base, like bulgur. I had tabbouleh at a party once and fell in LOVE. When I discovered the base for tabbouleh was this really high fiber, nutty, nutrient packed inexpensive grain called bulgur, I was sold! I like this grain too because you don’t really “cook” it. 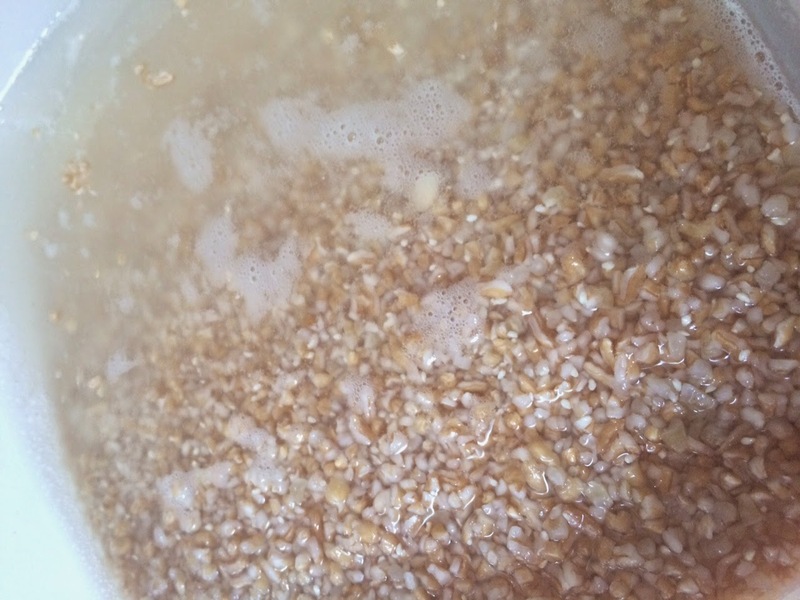 You boil the water, and then pour it over the bulgur and let it sit for about 15 minutes before you drain the excess water and it’s ready to use. This means you can just let it sit there on your kitchen counter, letting you focus on other meal prep areas. 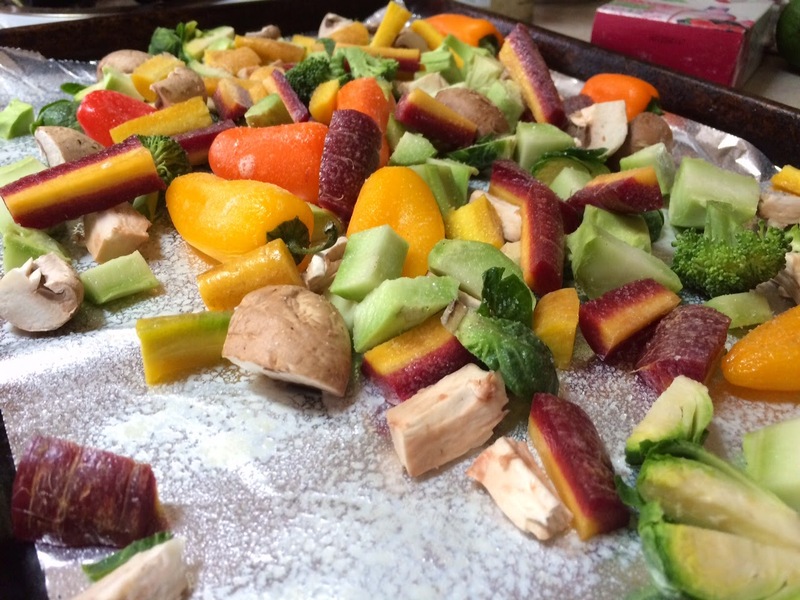 While my bulgur is sitting, I usually prep my roasting veggies! I love all sorts of veggies roasted. It really brings out that delicious *sweet* flavor that hides in raw or steamed veggies. Here I have some rainbow carrots, mini peppers, broccoli, brussel sprouts and mushrooms. I sprayed these with Trader Joes coconut oil spray, sprinkled sea salt over the top and roasted them at 425* for about 15 minutes. You could roast them a little longer if you like the softer, but I like my veggies pretty firm still. **Tip for mommy’s who make their infant/tots food! 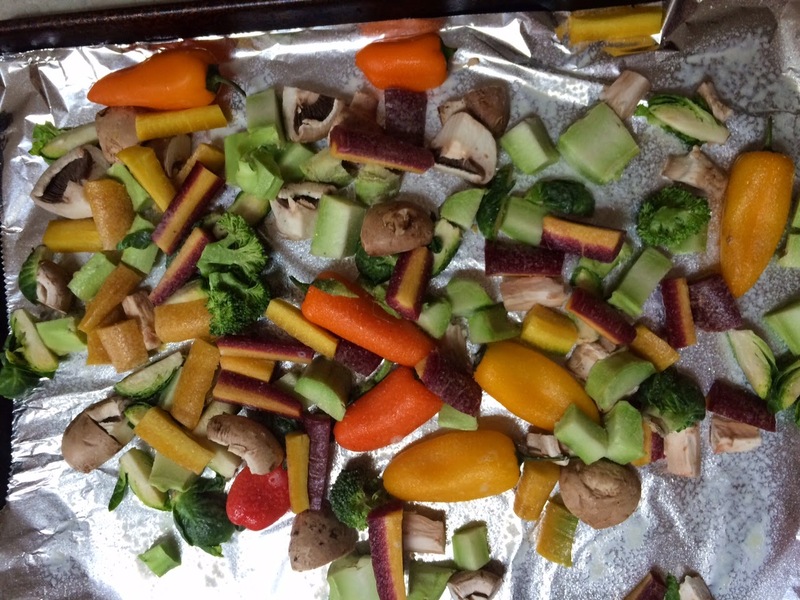 Roast a little bit more veggies and a couple small sweet potatoes and throw all of it into a blender… so easy, so inexpensive and SO much fun discovering what they do and don’t like, as well as developing their little palettes! I’m a foodie, so I really enjoy influencing that part of their lives :). While the veggies are roasting, you can go ahead and get all of your other ingredients out, set out your containers and make a little assembly line of what you want on your salads :). After you put the lettuce on top, now it’s probably about time to give that salad some roasted veggie loooooove. Pile ’em on because they’ll add SO much flavor to your salads! After that, I usually add a couple heirloom tomatoes and some Feta cheese to top it all off. Now for the hardest part… Put the lid on and put them into your fridge. It’s SO tempting to eat them ALL, buuuut then you won’t have any lunches for the week! And that would be so sad :(. I use these as part of my 21 Day Fix Meal prep. 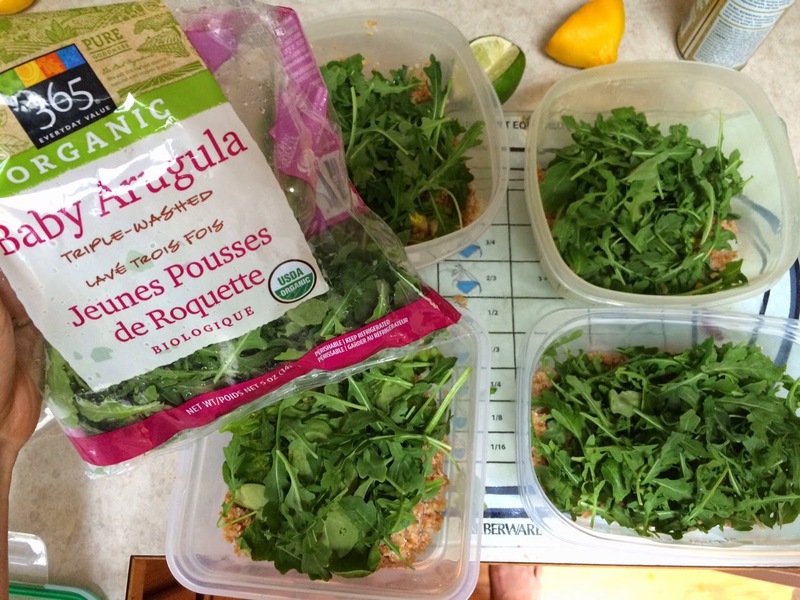 For a whole day prep, go to my website here. And if you’d like to follow my fitness adventures and see the free workout videos I post, visit my Facebook page here! Next Post "Breakfast on a Stick"